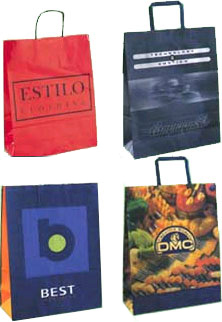 Show your commitment to ecological protection by choosing a promotional carrier bag from our Ecco recycled paper carrier bags. Our Ecco Classic paper bags are carefully manufactured from strong brown, white or recycled kraft paper. For the ultimate finishing touch choose between the flat paper tape handle or our rigid paper twisted handle.